Most ordinary workers are aware that New York State lunch break laws exist, but many are often confused about the extent of their rights under the law. Meal break laws in New York protect workers by requiring their employers to give them at least a 30-minute break period for meals. Not everyone always takes a meal break. Sometimes, we are so engrossed in our work that we skip lunch by choice. Sometimes a work schedule is so packed that we hardly can find a minute or two to have a sip of coffee, much less sit down and have a full-fledged lunch. As employment discrimination lawyers, we are asked the same lunch break questions over and over again, and so we hope that by addressing many of these common confusions here, we can provide you with a quick answer without having to call an attorney for advice. Section 162 of the New York Labor law code explicitly requires employers to give meal breaks to all employees who work at least 6 hours. The law was enacted as a workers’ rights measure to help protect employees from abusive employer practices. Employers used to require their workers to work straight through the day without a lunch break, but such policies are not only cruel, they are unhealthy and potentially dangerous. Malnourished workers tend to be more exhausted and are more likely to make mistakes while on the job, which could result in injuries. All private and public sector employers and their employees who work in New York State are covered by the law. However, where you work will determine how long of a break you receive. The New York meal breaks law contains different requirements for factory workers and non-factory workers. Factory Workers are entitled to a 60-minute lunch break between 11:00 a.m. and 2:00 p.m. and a 60-minute meal break at the time midway between the beginning and end of the shift for all shifts of more than six hours starting between 1:00 p.m. and 6:00 a.m. and lasting more than six hours. Factory workers can have their lunch breaks shortened by their employer to only 30-minutes, but factory workers are entitled to have the full time available where they would face hardship as a result of the shortened duration. Non-Factory Workers are entitled to a 30-minute lunch break between 11:00 a.m. and 2:00 p.m. for shifts six hours or longer that extend over that period and a 45-minute meal break at the time midway between the beginning and end of the shift for all shifts of more than six hours starting between 1:00 p.m. and 6:00 a.m. Like factory worker lunches, non-factory worker lunches may also be shortened to thirty minutes unless it would create a hardship for the employees. Federal law does not require employers to provide any lunch and/or meal breaks to employees. However, when employers choose to provide their employees with lunch and/or meal breaks that are twenty (20) minutes or less, the Fair Labor Standards Act requires that employers pay employees for that time. Similarly, if a lunch and/or meal break lasts for thirty (30) minutes or more, the employee does not have to be paid for the time on break. In addition to the required lunch meal time, all workers are also entitled to an additional 20-minute meal break between 5:00 p.m. and 7:00 p.m. for workdays that extend from before 11:00 a.m. to after 7:00 p.m. Meal break law violations are more common than you might expect, and even some major corporations that generally have good reputations break the law. For example, Apple was caught violating California’s meal break laws just last year. Note: Your employer is not required to compensate you for time you spend while eating lunch or meal. This is because meal periods that meet statutory requirements are not required to be counted as “hours worked,” and employees are not required to be paid for such time. An employment relationship must be distinguished from the strictly contractual one of an independent contractor, as only employees are entitled to lunch/meal breaks under the NYLL. An employee is dependent on the business which he or she serves while an independent contractor is engaged in a business of his or her own. On its face, Section 162 of the New York Labor Code (New York State Lunch Break Law) seems very simple and easy to understand. As long as workers are permitted at least a 30-minute lunch break, the employer has met the requirements of the law. However, many different unexpected circumstances can arise in the workplace, and it is often difficult to know how the lunch break laws in NY will apply to a particular situation. Q: Can my employer require me to take a lunch break? 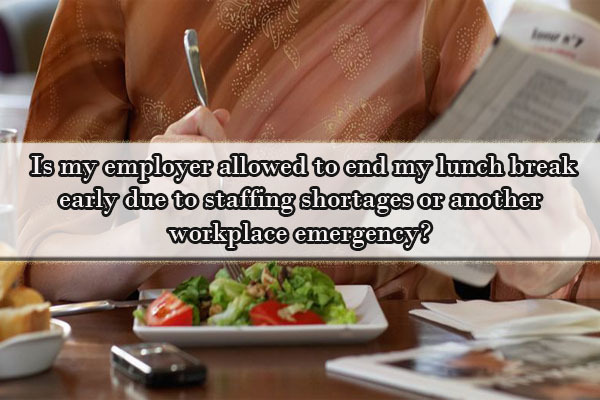 A: Yes, your employer can require you to take a lunch break. If you refuse, you may be terminated. Q: Does taking a coffee break affect my ability to take a lunch break? A: Fortunately, no, lunch breaks are entirely unrelated issues legally from short breaks, bathroom breaks and coffee breaks. New York State’s short break laws do not actually provide substantial worker protections. No employer is actually obligated to give an employee any short break at all. This is one of the many reasons why the lunch break is so important, because it might be the only allowed break during the day. Most employers will voluntarily give breaks; however, and those breaks must be compensated in accordance with New York’s wage and hour laws. Federal law does require all employers to give bathroom breaks to their employees. Q: My employer only allows us 20-minutes for lunch and she said that was legally allowed. Is she lying to me? A: Maybe, but it depends. The New York Department of Labor does allow exceptions to its 30-minute minimum lunch break requirement. Permission is normally only given in very special or unusual cases, and it is also only given after the Department of Labor thoroughly investigates the need for a shorter lunch. In other words, if your employer got special permission for a 20-minute lunch break, you may be forced to eat quickly. For example, certain technical employees might be required to take shorter lunch breaks where being away from their desks for long periods of time would be detrimental to the business. If your employer does not have that special permission, you have a right to demand a 30-minute lunch or you can involve the NYS Department of Labor. Q: Can I substitute my lunch time for an early release from work before my shift is done? A: Generally, no. Remember that a lunch break is defined as a 30-minute window between the hours of 11:00am and 2:00pm. Foregoing your scheduled lunch at noon will not allow you to leave at 4:30pm instead of 5:00pm because it is outside of the statutory time window. That said, if you and your employer agree to such an arrangement, that is 100% acceptable unless the agreement takes the form of a long-term contractually binding arrangement that could result in the employee being denied a proper lunch time if he or she wants to have one. Q: Can my employer force me to eat my lunch from my desk or take a working lunch? 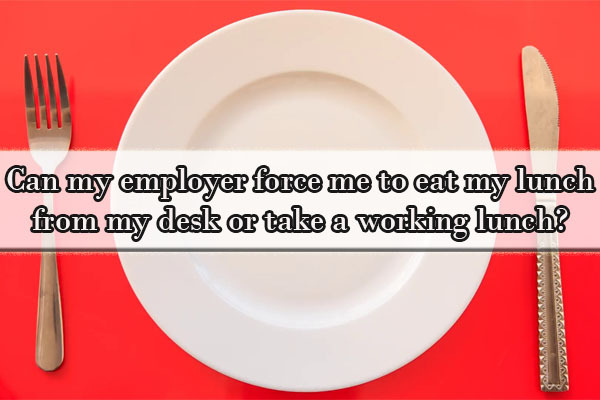 A: No, your employer is not allowed to force you to eat lunch at your desk. For a lunch break to comply with New York state break laws, the employee must be completely relieved of their work obligations during the lunch break. In general, employees who are required to remain at their desk or workstation during meal periods are not considered to be completely relieved of their duties. However, you may voluntarily eat lunch at your desk. In some instances where only one person is on duty or is the only one in a specific occupation, it is customary for the employee to eat on the job without being relieved. For example, many security employees will eat their lunches at their desks so that they can continue to monitor the workplace and keep other employees safe. The Department of Labor will accept these special situations as compliance with Section 162 where the employee voluntarily consents to the arrangements. However, an uninterrupted meal period must be afforded to every employee who requests this from an employer. Q: Can my employer force me to remain on the jobsite during my lunch break? 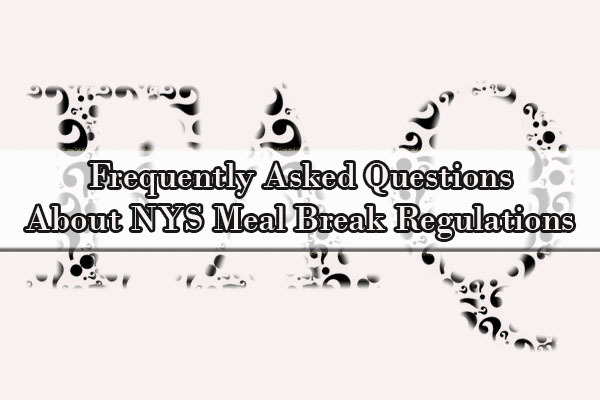 A: While an employer may not be allowed to force you to eat lunch at your desk or at your workstation while working, there is nothing in the New York State lunch break law that requires that an employee be permitted to leave the work premises for the meal period. So long as the employee is completely freed from duties during the meal period, an employer can require you to stay on the job site during your lunch break. For example, an employer can require that employees either bring their own lunch or eat at an on-site cafeteria or in a designated break room. Q: Is my employer allowed to end my lunch break early due to staffing shortages or another workplace emergency? A: Under Section 162 of the New York State Labor Law Code, employees are entitled to at least a 30-minute lunch break without exception unless the employee voluntarily waives his or her right to lunch. This means that it does not matter if staffing shortages or emergencies make it difficult for your employer to give you a lunch break – they still have to follow the law. Walmart was successfully sued over this type of violation under a similar California law several years ago. That said, Section 162 is a flexible law and an employer can reassign your lunch break to anywhere within the 11:00am to 2:00pm window. In other words, if you normally eat lunch at noon, but due to staffing shortages, your employer is asking you to take your lunch at 1:00pm instead, that type of scheduling is permitted under the New York meal break law. Q: Can an employer force me to eat a “brown bag lunch” under New York State law? A: “Brown bag lunches” are where employees eat their lunch while listening to a speaker or some sort of presentation. The topics of such lunches may be work-related or not related to work (e.g. related to health and wellness issues, personal finances, retirement). All employees must be allowed an uninterrupted meal period and must be free to leave their work area and engage in other pursuits. Even if the topic of the brown bag lunch session is unrelated to work, your employer cannot force your attendance unless your employer also provides you an additional break from lunch, if you choose to take it. Even if a meal is served at a brown bag lunch event, your employer must pay you for your hours worked as though you were performing your regular job. However, employees who voluntarily choose to attend such lunches on topics, are receiving a meal period under the law, do not have to be paid, and are not entitled to an additional lunch break. 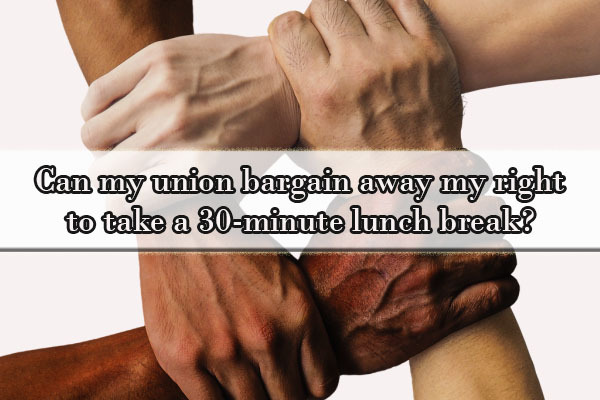 Q: Can my union bargain away my right to take a 30-minute lunch break? The employees received a desired benefit through the negotiations in return for such a waiver. In other words, a union can bargain away your lunch period where your employer needs your extra time working and all of the union employees received some benefit (such as higher pay) in exchange for the bargain. See, ABC Broadcasting v. Roberts, 61 N.Y.2d 244 (1984). Q: I understand that my employer does not need to pay me for time I spend eating lunch, but is my employer breaking NYS lunch break law by rounding the starting and stopping time of my meal breaks? A: Not necessarily. Rounding of time is a practice where employers will round the beginning and/or end of a shift or meal period to an interval. For example, rounding occurs when an employee arrives at work at 8:00 and the time records note that the employee arrives at 8:00. The Department follows the principles set forth in federal regulations (29 CFR §785.48(b)) with regard to the rounding of time. That regulation recognizes that rounding is commonly accepted in industry at intervals ranging from 5 to 15 minutes and permits such rounding. Extending the rounding regulation to the meal period requirements is proper, so long as rounding of starting and stopping time for the counting of meal period requirements does not, over a period of time, result in a failure to provide employees with the required meal periods. In short, rounding of time is permissible as long as it does not result in employees losing time. 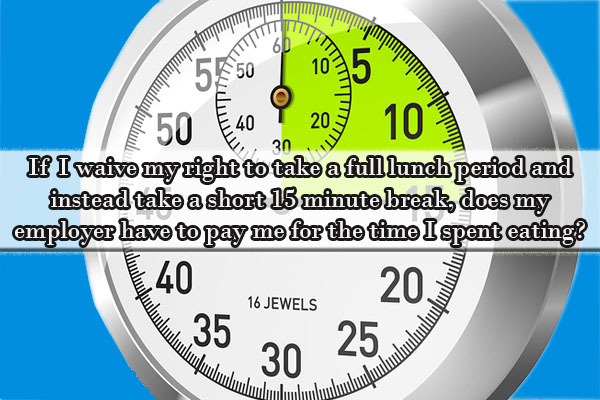 Q: If I waive my right to take a full lunch period and instead take a short 15 minute break, does my employer have to pay me for the time I spent eating? A: The short answer is yes, but there are caveats to this rule. Your shorter 15 minute lunch break period is most likely categorized as a “short break” under the NYS labor laws rather than an actual lunch period. While the NY state labor laws do not require that employers provide rest periods of short duration, if they are provided to or taken by employees, they must be counted as working time. The Department of Labor follows Federal Regulation 29 CFR §785.18 which provides that rest periods of short duration, running from 5 minutes to about 20 minutes, are common in the workplace. They promote the efficiency of the employee and are customarily paid for as working time. They must be counted as hours worked. Compensable time of rest periods may not be offset against other working time such as compensable waiting time or on-call time. That said, if you choose to take a shorter break for lunch rather than a full lunch period, your employer has greater say in how long your break is allowed to be. For example, if an employer prevents you from taking more than a 5-minute break, you may be forced to take a real lunch break or a working lunch to actually have enough time to eat. Have You Ever Experienced a Violation of Your Right to Take a Lunch Break in New York? Unfortunately, the practice of depriving employees of their earned lunch breaks is widespread, and we would love to have the chance to hear your stories. Know your rights under New York law and do not neglect them. If you feel like you have been wrongfully denied a meal break, you should act to protect your rights and hire an experienced employment law attorney to evaluate your claim. If you work in New York and your employer is violating the law by failing to provide you with a meal break, one can assume that your employer might also be violating other employment laws, such as anti-discrimination laws and/or wage and hour laws. 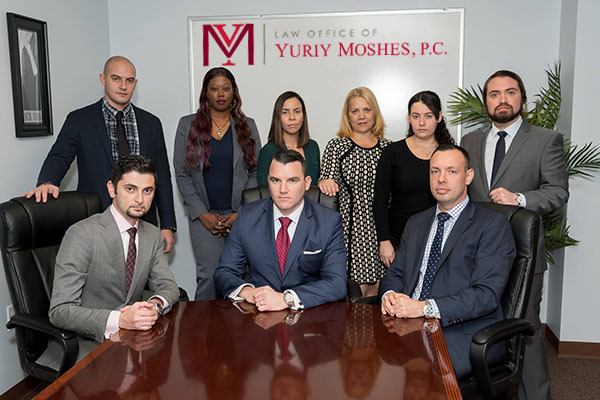 The Law Office of Yuriy Moshes is a full-service employment law firm specializing in labor law violations, workplace rights, wage theft, and employment discrimination claims. Our law firm operates in the New York City area and provides all employment law clients with a free consultation to assist you in evaluating your case. Disclaimer: This article is designed for employees working in New York State only. Many states have similar meal break laws; however, for additional information on those laws, you should reference sources within your state that explain the rules applicable to your workplace environment.